This is a listing for an acrylic wall mount sign holder. With these acrylic sign holders you can display important information or advertisements. The acrylic construction features polished edges to give a clean finish. The one piece design also allows you to quickly and easily interchange the sign on display. This prevents any removal from the wall to change your information displayed. The high grade acrylic used in the construction of this sign holder can withstand the fast paced nature of retail environments. The two anchor points provide a secure attachment to the wall and is simple to install. The wall mount nature of this sign holder means it can be placed in almost any empty wall space. Unlike many other economy versions this deluxe sign holder is constructed of high grade clear acrylic that is twice as thick as what is used on economy sign holders. This increases the stability and durability greatly. Polished edges are also a feature missed on economy sign holders that gives a professional finish to your display. The sizes listed are for the size of your sign. The back portion comes up a little higher for the holes. 1/8" thick clear acrylic cut, heated, and folded. This large acrylic sign holder can be displayed hanging or wall mounted. It is available in 2 large sizes. 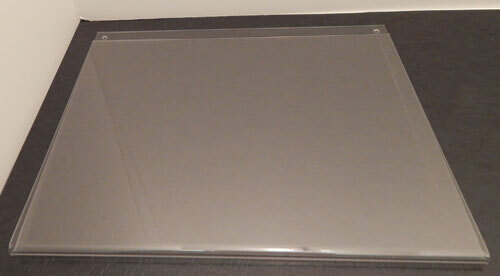 Clear acrylic construction is highly durable and gives a clean professional look. This acrylic sign holder is for wall mount display. It can accommodate vertical signs and is available in 6 different sizes. 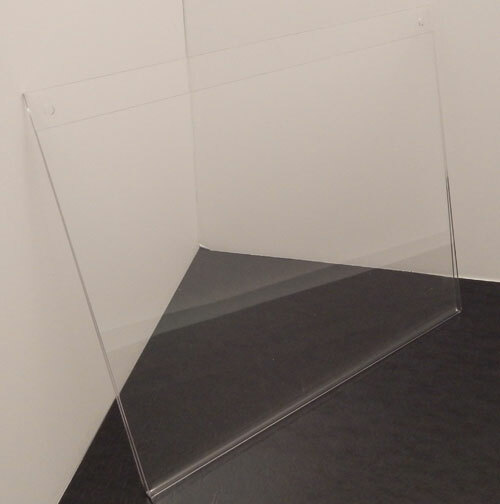 Clear acrylic construction is highly durable and gives a clean professional look.